Looking at old maps of Duluth can sometimes give a sense of the optimism that pervaded developers’ hearts back around the turn of the 20th century. They often platted streets that were never built, and perhaps only the sharp-eyed hiker or map enthusiast may find the remnants of those grandiose plans. In the upper Riverside neighborhood between the DWP Trail and the winding Superior Hiking Trail, below West Skyline Parkway, you will find the remnants of such a big plan: Lanigan Boulevard. Today, Lanigan Boulevard essentially serves as the gravel driveway for a single house, as does a portion of nearby North 94th Avenue West. But in the 1910s, it was intended to serve as the grand entry to a neighborhood bearing the family names of two Irishmen who were going to make their names—and their fortunes—in the mining boom. When Nathaniel and Thomas Upham of the Duluth Home Company platted the Riverside Park Second Addition in 1919, its streets were named by real estate investors Charles A. Lanigan and William A. McClaren. These plans included Lanigan Boulevard, Francis Street (named for Lanigan’s first born son) and McClaren Street. The addition was bordered by 101st Avenue West on the west and 94th Avenue West on the east with Gogebic Street on the north. Gogebic Street still exists, but peters out into the gravel Lanigan Boulevard. 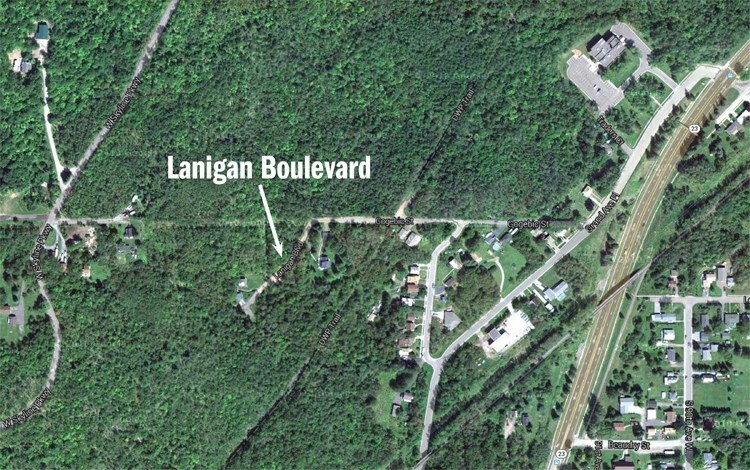 Lanigan is nothing like what one might expect of a “boulevard,” commonly a wide divided roadway. Charles A. Lanigan came to Duluth from Pennsylvania, probably following a large Irish extended family. It is unclear if all the early Duluth Lanigans were related, but it is possible, given the fact that at least two Duluth Lanigan families had roots in New Castle, Pennsylvania. If they were all related, they were certainly a colorful bunch—“Old Mother Lanigan” was a frequenter of the town’s jail for drunkenness circa 1890, and seemed nonetheless beloved for her antics. Another Lanigan was a survivor of the shipwrecked Siskiwit, which went down on Lake Superior near Grand Marais December 22, 1879. John T. Lanigan gained local prominence as the owner of the Lanigan Chophouse and Saloon at 415 West Superior Street and later became deputy sheriff. His little white dog Duke was also a prominent citizen of downtown Duluth, and the canine’s friendly ways were reported in the Duluth News Tribune in 1908, which noted that his daily visiting routine included the Lyceum drug store, the Lenox and St. Louis Hotels, and the Spalding Hotel lobby twice a day like clockwork. In any case, the first of Charles A. Lanigan’s immediate family members to show up in Duluth was his oldest brother William J. Lanigan, who got a job working for the Boyle Brothers. Their mother Mary was a Boyle, and her relatives Charles and James Boyle owned Boyle’s European Hotel and Restaurant at 317–319 West Superior Street, which was a popular place beginning in 1887 and on into the early 20th century. William soon encountered trouble, however, when he scandalously impregnated a young waitress shortly after he had married another woman—the fact that this kerfuffle hit the newspapers might give an indication of how little privacy mattered even in those days before social media. Next, Lanigan focused on Iron Range mines, enlisting physician William A. McClaren as his financier and partner in Almar Iron Mining Company. The Cuyuna Vermilion Iron Company took over Almar in 1912, forcing out Lanigan and McClaren. That year must have been a terrible one, because Lanigan also lost his new wife Alice to an unnamed illness that plagued her throughout their first six months of marriage. By 1918, Lanigan experienced better success with the Onahman Mining Company, and had remarried. That year, the couple spent their winter in Florida in the company of the Doctors McClaren (both William and his wife Sarah were physicians). They subsequently traveled to New Orleans, Memphis and Kansas City. However, fortunes quickly turned, and in 1920 just about the entire Lanigan family was living in a home near Grosvenor Square in Lakeside, including Lanigan’s elderly parents, three of his adult siblings, plus Charles and his new wife Ann with their infant son, Francis. This home at 4931 East Superior served as a Lanigan home base until the 1950s. After 1920, Lanigan turned exclusively to real estate. For about a year, he and his young family lived in a house at 2019 East Second Street, but they quickly moved on to Miami, Florida, where Charles died in 1924, leaving his wife Ann to raise their four children on her own. Meanwhile, his widowed brother William J. spent the 1920s with his unmarried sister Mary at the family homestead in Lakeside and ran a corner grocery store at 4931 Dodge Street until his death in 1932. Soon thereafter, Charles’ widow Ann returned to Duluth with her children, and settled in at the same family homestead. Meanwhile, at Lanigan Boulevard, the trees grew up over the ghosts of Francis and McClaren Streets, and the idea of a neighborhood bearing their Irish names disappeared.